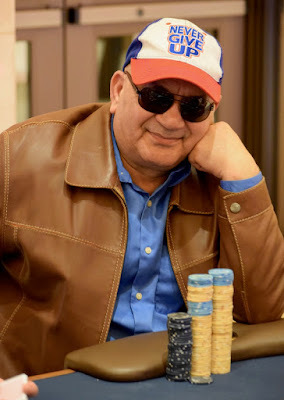 Arish Nat, Ken Jorgensen, Tom Emerson, Jed Hoffman, Mitch Gamble, Hieu Le, Mo Safapour (above) and Sasha Sabbaghian are among the 31 players looking for a Day2Bag here in Day 1B of the $300,000 Guaranteed $365 WSOP Circuit Event 1. Jorgensen - at 155,000 - remains the only player with a six-figure stack. Play is through 10 levels and 100 of the 131 entries are out. Play wraps up at about 12:15am at the end of Level 15.